If you’ve ever gotten sick, or felt rundown over the holidays, you’ve experienced the fallout of holiday stress. We could attribute it to the weather, or being around more people, but we can’t ignore that the increase of colds, illness, and fatigue over the holidays is directly connected to the stress that comes with this magical time of year. If self-care doesn’t come naturally, and you still insist on putting everything else before your own needs, you probably go into over-serving mode during the holidays. You go out of your way to make sure everything is ready, and everyone has the “best holiday ever.” Sound familiar? 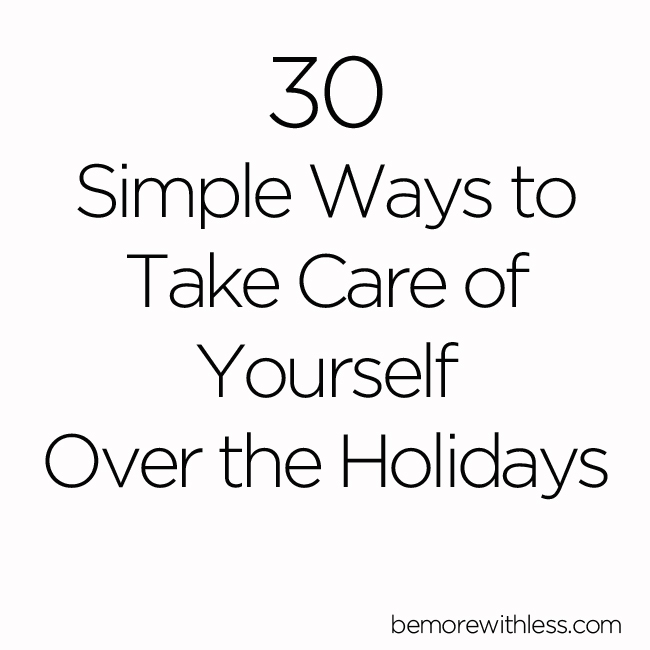 If you fall into that camp, or if you are just interested in taking extra good care of yourself over the next 2 months, try one of these 30 simple ways to take care of yourself during the holidays. If every day, you make a little time for yourself first thing, you can move through your day with more grace and intention. Your morning routine might only be 5 minutes long to start, but even that will help. Use the time to sit quietly with a cup of tea, meditate, journal, walk, or include other activities that feed your body, mind, heart, and soul. I love listening to music with candles burning or just sitting quietly in candlelight. As the days get darker, add light to your day. Yes, it’s coming back. I’ll be making an announcement soon for 31 Days of Gifts you so Deserve. This daily email program will help you engage in the best parts of this magical time of year. Go outside and take a walk. 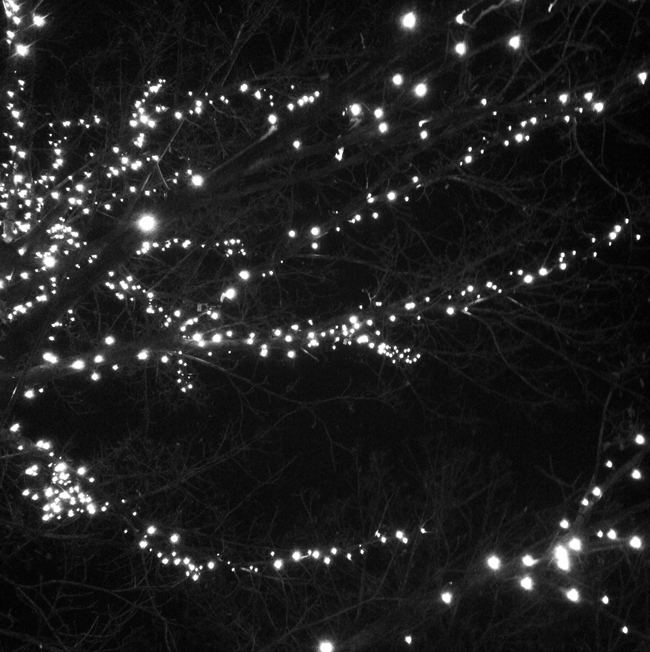 Bundle up if it’s cold and head out with the intention of noticing the magic. Don’t worry about burning calories or tracking steps, just enjoy yourself. Once you figure out what you can spend on extras like holiday gifts, events, and other holiday things, honor that. If you splurge now, you pay even more later. And later comes sooner than you think. When/if you are buying gifts, decline to leave your email address with a merchant. If shopping online, check out as a guest and don’t accidentally subscribe to email lists. They make it really easy for you to opt-in, but you’ll save the stress of future sales and shopping promos arriving daily in your inbox by opting out. Stay clutter-free, or at the very least, avoid adding to your clutter by sticking with a one in, one out rule. For each thing that comes in, another goes out. Apply this rule to gifts, clothing, and decorations. It’s easy to get swept away this time of year, but staying intentional will soothe your soul. I did this interview last year with my friend Jess Lively about how to approach the holidays with more intention. If you’ve been accumulating holiday decor for years, or decades, chances are your most meaningful, favorite things don’t get a chance to stand out. Start by only decorating with your favorite things instead of all the things. If that resonates with you, box up the rest or donate it if you love the simpler holiday wonderland you create. Make room for holiday magic to unfold and cancel some of your planned activities. Give your body and brain a chance to recharge on those go-go-go holiday marathon days. Even 20 minutes will make a big difference. Close your computer and other digital devices and curl up with a good book. Instead of reading something for self-improvement or work, read something for your heart. Call or spend time with the person that makes you laugh harder than anyone else. Then laugh until you cry. Emotions run high during the holidays, but much of what runs through our heads never needs to be said out-loud. Instead, write it down. Write down how you are feeling, and what makes you happy, sad, angry, or frustrated. Putting it on paper gives you a chance to clear your mind and move through your day with less bottled up stress. Finding the perfect gift is often stressful and expensive. Instead, find a meaningful gift. Give a friend your favorite book and write something to them on the inside cover. Give someone a beautiful vase you never use full of flowers, or look for other things you can pass on with love. If you aren’t sure how hyper-connectivity is affecting your life, try to remember the last conversation you had that wasn’t interrupted by a ding or a ring. Or, look around any restaurant, grocery store, or waiting room and see what percentage of people are looking into a screen. If you want to scale back, check out this guide to internet-life holidays. For some reason we really like to beat ourselves up at the end of the year for all that we’ve done and left undone. Sometimes it takes a big, heart wrenching mess to wake us up, to inspire change, and to finally release us from the guilt of getting there in the first place. When our imperfections are splattered all over the floor, it becomes clear that we had to go through it, to get to the lessons, and then the enormous blessings. It’s not too late. Your forgiveness will not only heal their hearts, it will heal yours. P.S. You don’t need an apology to forgive someone. Directing more of our attention towards gratitude for the things that make our lives wonderful are scientifically proven to make us healthier, more energetic, less stressed and anxious, and help us get better sleep. The very first thing you have to do to say goodbye to guilt is determine if you are actually guilty. Usually guilt is not guilt at all, but instead it’s sadness that you couldn’t do more to help, disappointment that you didn’t achieve something you set out to do, or anger because you said “yes” to something that deserved a “no”. Still guilty? Say goodbye. If we could stop equating abundance and wealth with extra zeros, all the toys, and more of everything, our self-worth would be more valuable than our net-worth. We could finally be grateful for the things we have instead of bitter for the things we don’t. Abundance is a full heart, not a full house. There are so many opportunities to give, so many people and organizations in need. Pick something close to heart and give the way you want to give instead of how you think you are supposed to give. Be creative. Write a poem, start a book, get out the finger paints and a big piece of paper, and express yourself. Make. Create. Enjoy the process with no expectations. Frustrated? Breathe in. Breathe out. Worried? Breathe in. Breathe out. Overwhelmed? Breathe in. Breathe out. Confused? Breathe in. Breathe out. Exhausted? Breathe in. Breathe out. Start there and you can often avoid over-thinking and over-reacting. There are benefits to moving through life, work, and relationships with a lighter step, a lighter look, and a lighter heart. If we want to be light, we have to let go. If you’ve already overdone it, consider a full stop. Sometimes backing off isn’t enough. Take a whole day to yourself and vow to do nothing more than take care of yourself all day long. Instead of working so hard to please people, do it all, or control the world, just be love today. Take care of yourself over the holidays. It’s the best gift you can give yourself and everyone you love. This is so beautifully all encompassing, I can feel the holidays being super relaxed already. I love “If we could stop equating abundance and wealth with extra zeros, all the toys, and more of everything, our self-worth would be more valuable than our net-worth.” – that is so powerful. Thanks for a great post Courtney. I need to apologise to someone and/but forgive them as well. It feels scary. But the weight of not seeing them hangs over me. I’ll let you know how it goes. I think that part about abundance is 100% true. Such a great reminder. PS – I’m excited to talk with you tomorrow! Oh man, this is good stuff! This is exactly the kind of thing that has been on my heart recently, as my favorite time of year approaches. I’m not immune to the pitfalls of this time of year, but I think because I love it so much and I’m an introvert by nature, I do some of these tactics already. It makes me sad when I hear people talk about how they hate this time of year because of all the stress etc. It’s really all a choice and it doesn’t HAVE to be stressful. My favorite tips of your are the “One in, one out” rule, as well as only using your best decorations. I have accumulated so many throughout the years, but as I’ve moved toward a more minimalistic and simplicity-focused way of life, I’ve found myself culling through my decor each year, and adding to the Donate box. It feels so freeing to know you love what you own, and see only the best out in your home! The “Going internet-lite” part struck me deeply too. I’m a work-from-home blogger and photographer so my life is largely spent in front of a screen. But I’ve made a conscious effort to distance myself from my phone more this past year. It’s amazing to pay attention out in public and see how obsessed and phone/screen focused we really are today. I think every single person would benefit from a little ‘internet-lite’ time this season! Thank you for the great food for thought!! WOW! I love this! Thanks for sharing. Good stuff! I try to be very careful with my commitments this time of year. It’s flattering to get invited to a lot of things and tempting to immediately say yes, but I hold back until I’m sure, because I don’t want to cancel on people or feel overcommitted. Great list….only doing my faves…this year, done with the never ending trying to please others…bring with right person helps sooo much.